Voluteers help run the Putting Lot. Everyone’s familiar with the site of abandoned buildings or half-completed construction projects around the city. But in Bushwick, a group of eco-minded residents had a new vision for an empty lot. Meet the Putting Lot on Wykoff Street. 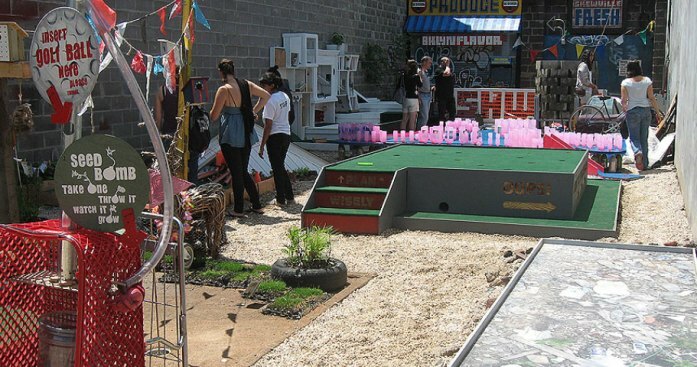 Formerly a vacant, garbage covered lot, it is now a minature golf course. The volunteer-run course was designed by Brooklyn artists using only recycled materials. The designer of the course explained her vision. "When the recession started, there were a lot of construction projects that just stopped in Bushwick," Gabriel Fries-Briggs, 23, told the Daily News. The duo and 20 volunteers worked ten hours a day for four straight days to clear the lot, the News reported. The Putting Lot will remain open Wednesdays through Sundays until Sept. 6. Admission is $5 for adults and $3 for kids.